Casey Lee-Sims has been studying and performing Balinese dance since the age of seven. 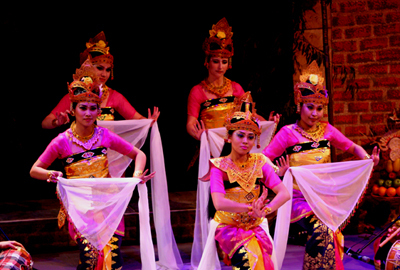 Having studied with some of Balis most accomplished dance teachers, she has developed a strong technical base in Balinese dance technique, and a deep love of the art. She is a member of the Balinese music and dance group, Burat Wangi, and the Javanese music and dance group, Kyai Doro Dasih. Currently, she is teaching Balinese dance at the Indonesian Consulate in Los Angeles. She has found a passion in teaching, especially young children, who have a serious interest in learning Balinese dance. It is our intention, as a whole, to constantly improve our technique, and expand our knowledge and creative ability of Balinese and Javanese music and dance. We are truly blessed to be a part of a family of teachers, musicians, and dancers whose love and dedication towards these arts has extended to each other, our families, and hopefully to our audiences. The essence of these art forms is about accepting the divine energy from the universe and earth, connecting that between each other, offering this out to our audience, and back to the divine through music and dance. We play music and dance from our hearts with pure, strong intention in the hopes that we may perpetuate this divine cycle of accepting, expanding, connecting, and offering. Burat Wangi and Kyai Doro Dasih are professional gamelan groups (Balinese and Javanese respectively) based out of the California Institute of the Arts in Valencia, California. Both groups consist of about forty members of dancers and musicians, some of which participate in both groups. These groups were founded in 1971 by the world renown Javanese gamelan master, K.R.T. Wasitodiningrat, his daughter Nanik Wenten, and her husband I Nyoman Wenten. Burat Wangi and Kyai Doro Dasih have aimed to share, educate, and spread appreciation for the beautiful performing arts that have emerged from the islands of Bali and Java in Indonesia. Through performances, lecture demonstrations, workshops, and cultural exchange programs, Burat Wangi and Kyai Doro Dasih have helped to expose the public to the rich and magical cultures of these islands throughout the years.